A startling fact about climate change is that for every degree of global temperature increase, grain yields fall 5 percent. With temperatures rising by nearly 1% since 1880, the United Nations has called for a renewed push on controlling the chief cause of climate change: carbon dioxide. But how can businesses and electric utilities contribute to lowering CO2 — whilst also becoming more efficient and profitable? Here are two bold ideas: Microgrids and Grid Automation. Microgrids: These are zones where energy can be managed autonomously. University campuses, industrial plants, and factories, are common examples. A microgrid can manage resources within its perimeter. These might include generation units — such as wind turbines, solar panels, and traditional fossil fuel generators — and energy storage. The microgrid weaves these power units into a single manageable whole. Power from the outside can be balanced with internal production. If needed, microgrids can run on an optional “islanded” mode, disconnected from outside power sources. Microgrids keep electricity flowing no matter what conditions or events are at play. Demand is also an important part of the equation and can be managed by new digital technologies. A microgrid monitoring system, such as Schneider Electric’s EcoStruxure Microgrid Advisor, ensures that decisions can be made according to real-time conditions. It is possible to know when to generate power, when to store it and when to buy it. Stability, power quality and the financial outcome are all improved as a result. Renewable credentials can also be boosted since a microgrid makes it feasible to blend alternative power generation with traditional sources. Consumers of power can now be producers too. They can feedback to the grid which allows these independent ‘prosumers’ to make significant savings. Montgomery County government in Maryland used microgrids to cement its reputation as one of America’s leaders in green technology. Schneider Electric and its partner, Duke Energy Renewables, proposed a strategy for the County to install two advanced microgrids and upgrade its outdated electrical infrastructure. The microgrids integrated a variety of power sources including major natural gas generators and photovoltaic, running in parallel with the utility grid. Since Montgomery is vulnerable to storms, which have previously left 250,000 citizens without power, a microgrid offers a failsafe in times of disruption. Plus, it allows local low-emission facilities to contribute to the energy mix — in particular solar and combined heat and power (CHP) plants. It’s now a key part of the County’s mission to lower emissions by 80 percent by 2050. Grid Automation: A second — and larger scale — example is the way utility companies are achieving higher levels of control and analysis and moving closer to decarbonization. Italy’s largest electricity distributor Enel is undergoing a switch to renewable energy with the goal of being carbon neutral by 2050. How can it do this? The solution lies in marrying green power generation with digitalization. Enel works with Schneider Electric to achieve this by adding sensors to equipment and gathering data across all systems. It feeds this data into a centralized visualization model. Now Enel can perform high-level analysis on voltage management, distributed generation, frequency control, demand response and smart grid management data. Green power sources like solar and wind can be woven into the mix smoothly. The advent of microgrids and smart distribution mean renewable energy can be introduced into the mix, both by local and national producers, resulting in a more sustainable and resilient grid. Digitized electric distribution networks maximize efficiency and contribute to a decarbonized grid while ensuring quality of supply and reducing costs. 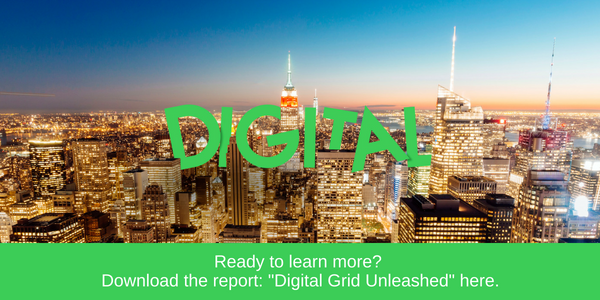 Digital distribution networks also benefit everyday energy consumers. New technologies can leverage demand flexibility and let smart utilities offer more and better services for their customers, optimizing their costs, improving grid reliability, boosting sustainability, and optimizing their grid operations at the same time. Energy experts call it the new world of energy, and these are just some of its components. It’s a phrase we are all going to be hearing a lot about. Learn more how EcoStruxure™ Grid can increase your distribution network’s efficiency, resiliency, reliability, and can help manage demand. I work in the waste management industry so I’m aware of the problems caused by excessive CO2 emissions. It also seems that methane may well become an even worse problem than CO2 as it’s stored in the polar ice caps, and as they slowly melt, huge methane deposits are released into the atmosphere. It seems that renewables may be our only hope for the future! I also didn’t know that Italy had such a large percentage of renewable energy (your article says over 40 percent). It gives us here in the UK something to aim for, although we don’t get as much sunshine as Italy so perhaps harnessing wave energy from the ocean may be something worth turning our attention to.